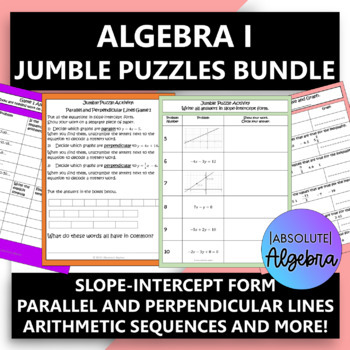 Your students will have fun practicing solving, graphing, and verifying two-step inequalities, combining like terms with and without the distributive property, identifying parallel and perpendicular lines using slope, writing the slope-intercept form of an equation, and identifying and writing, and finding terms of arithmetic sequences in this 9-game engaging word association activity called $100,000 Pyramid. Click here to join my ALGEBRA I email list and get free and discounted products and ideas to engage your students! When you sign up you'll get a free product in your email right away! Here are some Algebra I activities you may like! Click Here to Follow My Store and receive updates, freebies, and promotions!